These monitors give excellent sound reproduction. They boast 10" bass drivers which is complemented with a 5" midrange drivers and a 3/4" Al-dome tweeters. A strong Die-Cast aluminum enclosure make these bad boys tough. 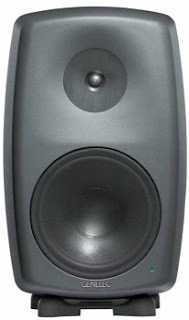 These are some of the better 390-watt Active Tri-amped Studio Monitors I have dealt with this year. They retail for about $5,000 each. For more info visit Genelec here.